Make learning fun with QuickStart Tennis teaching aids from Tennis Court Supply. 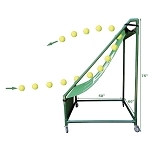 Use 6" Gamma Target Cones to set up obstacle courses, mark lanes, tennis targets, and more. Teaching aids like this allow you to come up with fun and creative activities to help teach kids tennis fundamentals. Sometimes, playing the game itself is not the best way to practice the basics! Here at Tennis Court Supply, we have everything needed for kids and adults to learn, play, and enjoy tennis. Check out our other kids' tennis supplies and QuickStart Tennis supplies, and if you need answers or advice about our products or setting up your own court, feel free to get in touch with us.